Inspired by pasta al limone, this lemon pasta brings arugula to the mix for an easy and brightly flavored 30-minute dinner. What do you do to shake the winter blues? Despite feeling inspired and staying productive, deep within my core I’m in some sort of funk. I just want Spring, but apparently it’s January 45th and winter isn’t going anywhere soon. As I type this, I realize that my friends and family back up in Canada are scoffing and shaking a fist at me as they deal with their annual “polar vortex”. (Or, have they come up with a new bogus name for winter storm systems since I’ve moved?) But no matter where you are, winter is winter. Winter is dark, winter is cold, and winter is miserable. Luckily, citrus is in season! Which seems like the perfect way to brighten up our spirits and our tastebuds. Lemon Pasta With Arugula—or Pasta al Limone. Have you ever had a classic pasta al limone? It’s as lemony and luscious as it sounds. Originally I’d planned on creating a recipe for Cacio e Pepe, but my mouth needed a pop of bright flavors. This recipe is inspired by one of my favorite Canadian chefs, David Rocco. He inspired this recipe for Pasta Aglio E Olio With Toasty Breadcrumbs and he’s become my go-to for simple, quick, yet elegant pastas. This recipe takes less than 30 minutes to bring together, making it ideal for weeknights or for a simple yet elegant date night in. A classic Pasta al Limone doesn’t incorporate arugula, but since arugula and lemon are best friends in my world, I thought it would make a nice addition. And it did! Plus, it’s always nice to throw in a healthy dose of greens. When it comes to choosing a pasta type, I recommend sticking with long pastas like spaghetti, linguini, or bucatini—which is what I used here. If you love the idea of easy weeknight pastas, head on over to my One-Pot Mediterranean Pasta With Mackerel! And for something *super* simple, this 15-Minute Pasta Aglio e Olio With Toasty Breadcrumbs. Bring a large pot of lightly salted water to a boil. Add the pasta and cook according to the package's instructions. While the pasta boils, choose a large bowl for serving. You'll be using this bowl to toss the pasta as well. Take the halves of your lightly smashed garlic and rub the garlic over the bottom and sides of the plate to coat it with flavor. Once the bowl is nicely coated with garlicky goodness, discard the garlic. Add the freshly squeezed lemon juice; gradually drizzle the extra virgin olive oil into the lemon juice with a slow and steady stream while whisking. Continue to whisk until the the oil and juice have emulsified. Whisk in a pinch of salt and half of the lemon zest. Drain the pasta when it's done and set aside. Add the cheese to the serving bowl with the oil and lemon, crack a generous amount of black pepper over the cheese, and place the hot noodles over the cheese. Carefully but thoroughly toss the pasta around the cheese and sauce with tongs until evenly coated. Add the arugula, and give the pasta one more toss. Grate some extra cheese over the pasta before serving, as well as the remainder of the lemon zest, and some more cracked black pepper. Serve immediately. This is just the kind of meal that I crave this time of year! Bright and refreshing, but still comforting and hearty (pasta). I love all of the ingredients and it's official: I'm making this with the meyer lemons I just scored from the market. Thanks for the inspo! Arugula, lemon, and parm regg are one of my all time flavor combos! I could literally live on it...and I do. Especially when there's pasta involved. This is a go-to for me...one that I can make again and again. Thanks for sharing your creation! What beautiful pasta dish! I love the bright green of the arugula and the contrast of the black pepper. This is the best sort of Italian food - bright, fresh, simple, and elegant. Oh my gosh I FEEL you. C'mon Spring! I always get in a winter funk, too. Thankfully it's usually cured by some sunshine but also delicious meals like this that remind me of summer! I hope you get out of yours soon! This lemon pasta with arugula sounds like the answer to my winter blues! I love all the bright and fresh flavors going on in it. And it's so easy! It would make a perfect Valentine's Day meal too. Great recipe! Lemon and arugula—what a great flavor combination. Lemon does have a way of bringing a little sunshine to break through the dreariness of winter. Extra cheese on top for me, please! Yum! I have to say i'm not jealous of your cold weather as I sit here in sunny Australia, having just gotten back from a lovely swim at the beach :) I will take your pasta though, perfect for any weather, and I really cannot pass up pasta with some fresh greens and a squeeze of lemon - perfection! Love how light the lemon makes this dish. I am trying to add in some greens to every meal and would have never thought to do that with pasta...except maybe spinach, but the peppery arugula sounds so refreshing and the perfect match for that lemon. A great well rounded pasta dish. First of all, can we all agree that bucatini is possibly the best and most underrated of the long pastas? Second, I LOVE this recipe. Lemony pasta is so, SO good and I feel like it's underappreciated because it doesn't look like much. That being said, you really made it look gorgeous with the bright, peppery punch of arugula. It's a fantastic flavour combination, and one I could and would gobble up on a regular basis. Cheers Dana! I love the touch of lemon with pasta -- we make it quite often. And sometimes instead of the arugula we'll add grape tomatoes. The lemon just adds the fresh taste. You've reminded of a pasta I want to make again. I'll follow your recipe with the arugula. Sounds good. Oh, Dana -- your Pasta al Limone is positively calling my name. 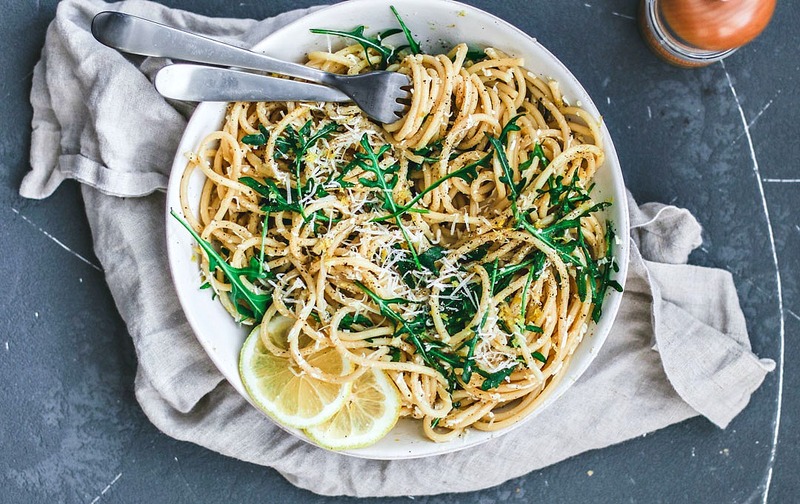 The simplicity, the vibrant lemon, the bitter arugula -- and hello -- spaghetti!!! You're right, the winter blues are definitely a real thing, but a satisfying dish like this (and a nice pour of wine) would lift me out of my funk. I'm picturing eating this at a cozy dining room table with a blue-gray snowy day outside and a crackling fire inside. That sounds pretty good to me. Bring on the citrus! In any meal of the day and dessert too, I am searching for reasons and ways for citrus to brighten up my winter days. This does just that! I like that this pasta looks elegant but is simple enough to pull off at home. Beautiful! Hubby and I were just discussing what we were going to cook for Valentine's dinner. We decided on a pasta dish that we could make together. This looks perfect, and sounds delicious too. We have already got the wine LOL!